Does this oil compartment lubes the clutch mechanism too? There's no oil in the clutch. There's some grease on the sliding parts and that is it. The clutch and plates are dry. Does it matter if the rear-end of the vehicle is raised? If so, why? You won't get all the old fluid out if the car is not level. You also won't be able to fill it with new fluid to the correct level. I realized that fairly soon after I posted that comment, lol. Thanks, blu3! I'm hoping the fluid will be in tomorrow. I don't have the originals, but I will be setting my car up for the track tomorrow and could take some while it is in the air and post them for you. It is pretty straightforward, though. There are two large hex plugs on the driver's side of the trans. The top one is the fill plug (to be removed first), and the bottom one is the drain plug (to be removed second). Remove the plugs in the proper order, drain the fluid, clean the plugs. Screw the drain plug back in and torque to ~30 ft/lbs, then add appropriate gear oil until it starts running back out the fill hole (about 1.8 qts IIRC). Screw the fill plug in and torque to ~30 ft/lbs. Clean everything up with paper towels and maybe brake cleaner. Take the car for a drive that is long enough to completely warm it up, then park it and check for signs of leaks. If there are none, you are finished. Have a beer. Last edited by Steve Dallas; 04-30-2016 at 05:06 PM. 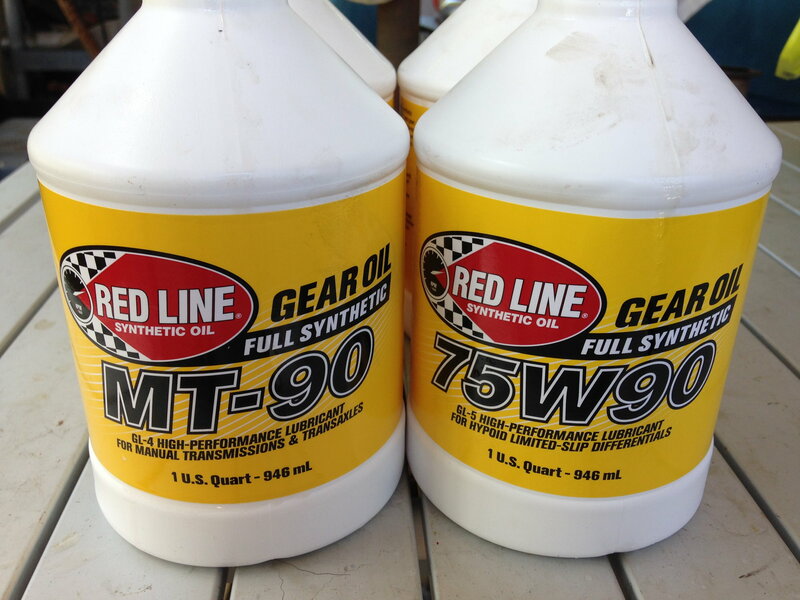 I did replace the original MT fluid (45K miles on her) with Redline MT-90. No perceived differences. I've put 400 wonderful miles on her driving to Winston-Salem, NC in preparation for DGRR mid this week. I can recommend MT-90 for the S2 transmission fluid. Done today: Manual transmision and differential oil change. The car feels incredible smooth. What's everyone's experience with Motorcraft XT-M5-QS? Mine was put in maybe 12k miles ago, and it shifted kinda rough. I drained it a couple of days ago and filled it up with some Motul 300 based some recommendations. The old fluid(Motorcraft XT-M5-QS) is pretty dark and my friend said it smells a bit burnt to him(I didn't really smell it; I hate the smell of that stuff even when it was fresh). That's a bit surprising for a synthetic fluid. My car is used for spirited DD and 2 AutoX events only. No tracking. The new Motul 300 is starting to break in and the shifting quality definitely has improved. The specs were correct. The XT-M5-QS is a GL-4 75W-90 fluid. The Motul 300 is actually compatible with both GL-4 and GL-5. My diff fluid was pretty clean, but I changed it out with some Motul 300 LS, which is a 75W-90 GL-5 fluid. You can use straight 90, 80W-90 or 75W-90 in the diff.